In a world run by machines, humans are an endangered species -- and their only hope is a rebel warrior with nothing left to lose. The Great War is over. The robots have won. The humans who survived have two choices: they can submit and serve the vicious rulers they created, or be banished to the Reserve, a desolate, unforgiving landscape where it's a crime just to be human. Following the orders of their soulless leader, the robots are planning to conquer humanity's last refuge and make all humans bow down. On the run for their lives after an attempted massacre, Six and Dubs are determined to save humanity before the robots wipe humans off the face of the earth. Pushed to the brink of survival, they discover a powerful secret that may set humanity free, but to succeed they'll have to trust the unlikeliest of allies . . . or be forced to bow down, once and for all. Full of twists and turns from the world's #1 writer, Humans, Bow Down is an epic, dystopian, genre-bending thrill ride you'll never forget. James Patterson received the Literarian Award for Outstanding Service to the American Literary Community at the 2015 National Book Awards. Patterson holds the Guinness World Record for the most #1 New York Times bestsellers. His books have sold more than 325 million copies worldwide. 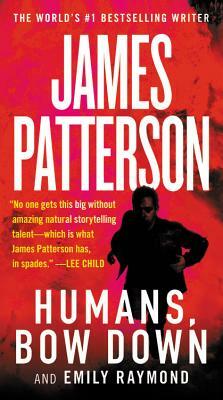 "Behind all the noise and numbers, we shouldn't forget that no one gets this big without amazing natural storytelling talent--which is what James Patterson has in spades." "James Patterson is The Boss. End of." "The man is a master of his genre. We fans all have one wish for him: Write even faster." "Patterson knows where our deepest fears are buried...there's no stopping his imagination."